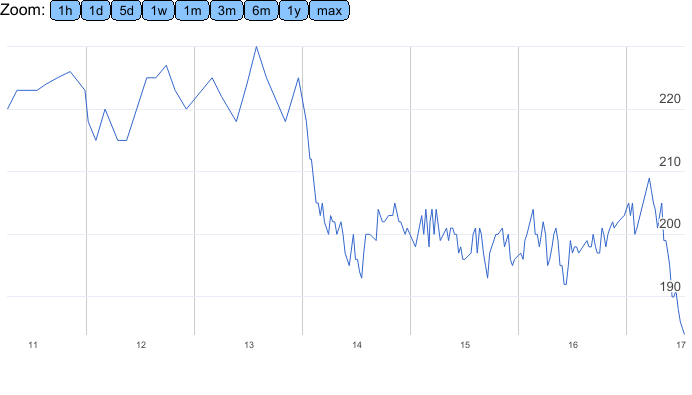 I’ve been tracking my weight every week since 2011. But it wasn’t until the start of 2014 that I really began to lose weight after adopting the slow-carb diet as proposed by Tim Ferris in the book The Four Hour Body. I went from 225 to about 195, down about 30. Later on I would lose 10 more than that, but after having gained a fair bit first. The basic idea of the slow-carb diet is to eliminate sugars and most carbohydrates and replace that them with beans, vegetables and proteins. Don’t drink anything with calories. Eat the same meals six days a week, and have one cheat day when you can eat and drink whatever you want. There’s a nice summary of the slow-carb diet here. Although I ended up being pretty good about what I was eating, I didn’t go all out as suggested in the book, I didn’t use supplements, I didn’t take cold showers, I didn’t get my body fat professionally measured, that sort of thing. I did increase riding my bike to work, or going on a lunch time walk if I used the car. I did have an egg and some egg white with beans and mixed veggies as breakfast most days. Beans, vegetables and meat were the basis of most meals. Nothing special as suggested in the book, though I did watch for fat and sugars. e.g. I found a low fat canned chili that I quite like, just add some frozen mixed vegetables, heat and that’s dinner. There’s a number of things I like about the diet. The weekly cheat day makes if feel like you can eat anything you want, just not every day. So you can save up those urges for your cheat day. Personally, I like eating the same foods over and over. It means I don’t spend a lot of time shopping or preparing food, it’s mostly the same things over and over again. But others might find that a drawback. One thing I did not like is that when I was really on the diet there were days when I really felt fatigued. Especially when I rode my bike to work (50 minutes each way). I would come home and really not want to do much. I came to learn that’s part of losing weight and a low carb diet. To help with that I did reduce the amount of coffee I drank. I probably could have added more healthy snacks to have during the day, maybe increased my protein intake. I could have balanced out my diet a bit better, maybe lost weight a bit slower, but had more energy. I had set a target of 200 pounds which I reached fairly quickly. Later I set lower targets like 190, but after awhile I would relax the diet and the weight would come back. I couldn’t seem to stay below 200. Early this year, when I was back over 205, I wanted to get serious about the diet again. I had read Cal Newport’s book Deep Work and in there is a section based on The 4 Disciplines of Execution (4DX) book. I read that book and decided I could do something to help with my diet. 4DX proposes four disciplines to help companies execute on their strategy. There’s a nice summary of 4DX here. I was at 207 pounds, I set a target of 185 and a time frame, lose 1 pound per week. I made it a priority, buying more expensive lunches that fit my diet, or taking the time to make a lunch to bring to work. Also taking more time out of my day to exercise more by riding my bike to work more often. 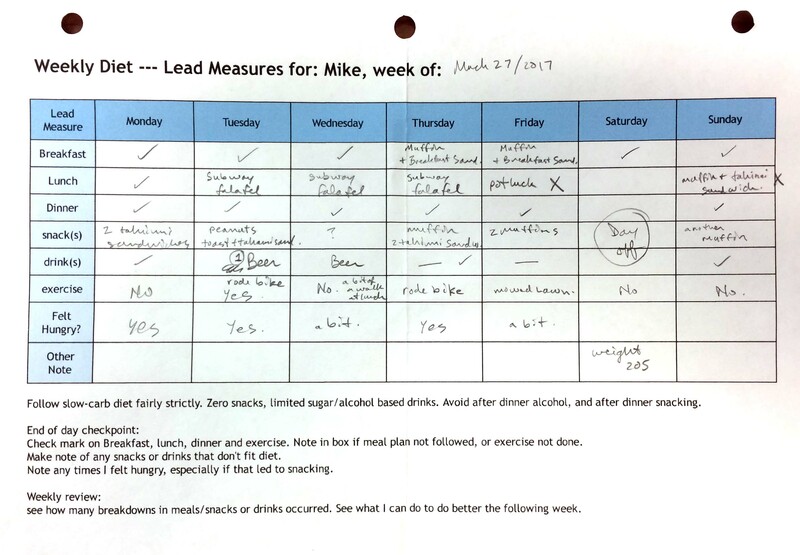 I decided that whether I was following the diet for each meal, whether I had snacked outside the diet, and whether I had exercised or not that day would be my lead measures. I created a worksheet I could fill in each day to track this and any notes I might have. 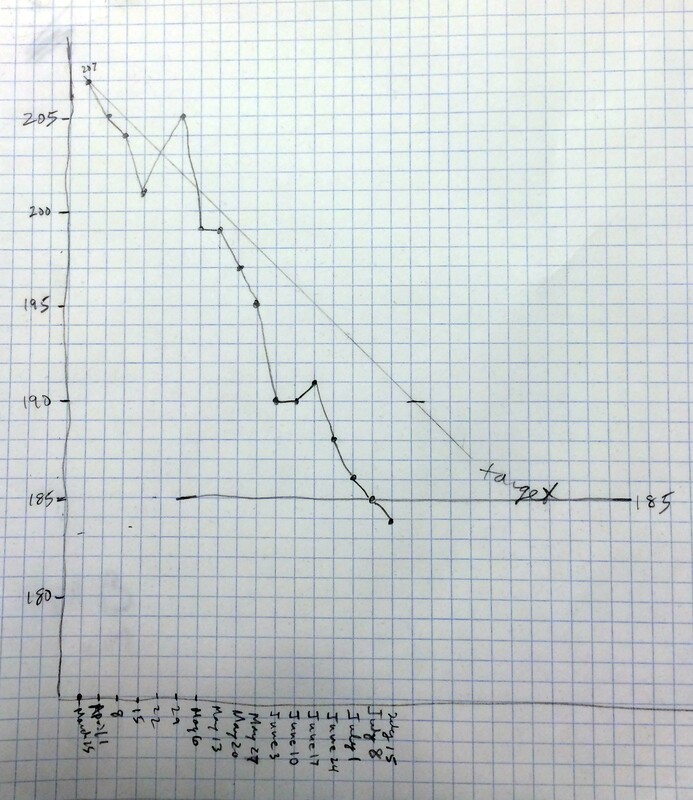 This would be a paper chart showing my weight each week with a target line of losing one pound per week. 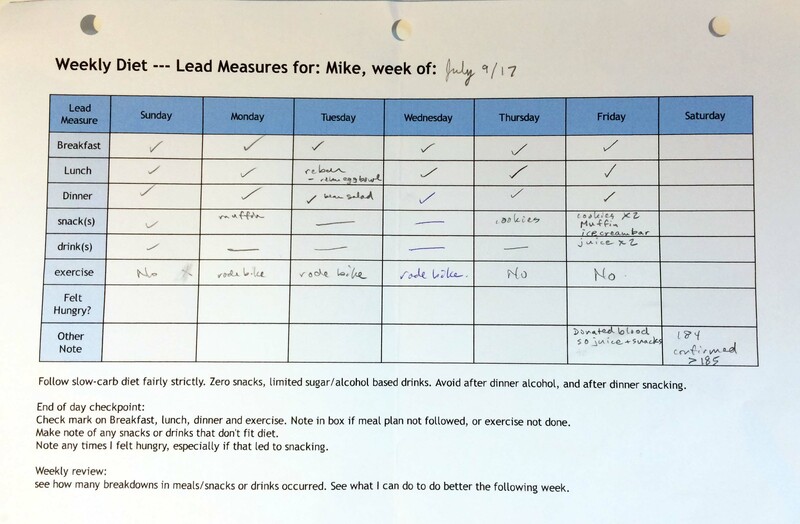 The Lead Measure sheet would create daily accountability and the scoreboard would create weekly accountability when I weighed in and updated the chart. I still tracked my weight in my Google spreadsheet, but I added a scoreboard chart that I hand drew and had next to my bed. This showed my progress or lack thereof towards my goal and was visible to me everyday. It started with a weigh in at 207 pounds on March 15. 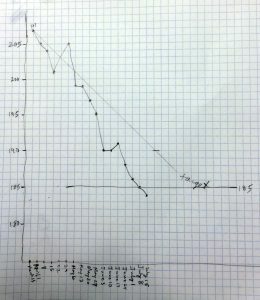 Each week I would update the chart and I could compare that to my target line. In the end I lost 23 pounds in 17 weeks, and I reached my target two months earlier than my plan. Weighing yourself doesn’t help you actually lose weight. 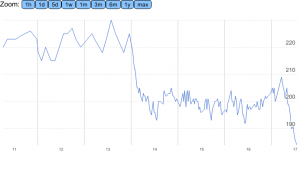 It’s a lag measure like a company’s profit for the quarter, it measures something after the fact. 4DX adds the idea that you have to act on lead measures. Lead measure are things you do (that you can measure) that you are pretty sure will lead to improvements in your goal. e.g. a bakery might track the number of free samples they hand out and determine if increasing that number increases the lag measure of profit. I decided obviously that whether a meal had followed the slow-carb diet had to be part of the lead measures. I also wanted to track whether I snacked or had drinks that were not part of the diet. Obviously the fewer of those, the better. I also wanted to track how much exercise I was getting, which usually involved a walk at lunch or a long bike ride into work. 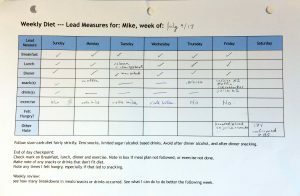 So I created a Diet Lead Measures worksheet to track all this each and every day, except the cheat day. 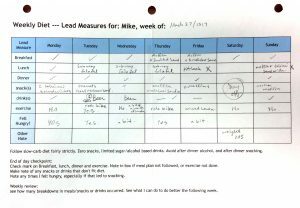 I would carry the lead measure sheet around in my laptop bag so it was with me most days. In my first week above, you can see that I wasn’t all that good about following the diet, which is of course why my weight had crept back up in the first place. I already had meal plans for the diet, so I didn’t track what I was eating if it was part of the diet, just a check mark was enough. The idea was to note meals that were not part of the diet, and to serve as both incentive to follow the diet and make myself accountable. Knowing that I would have to update the sheet if I cheated was sometimes incentive enough to stop, but not always. I learned that when I’m stressed I would sometimes snack or have a beer without thinking. Later on I was able to look back and see clear examples of good and bad weeks. Good weeks when I rode my bike into work every day (50 minutes each way), and followed the diet well including taking a lunch to work, and lost 5 pounds. I could excuse some bad weeks when I was under stress or travelling, but often there was no excuse. Those weeks made me realize that I had to plan better, to make up lunches that I could take to work to avoid having to eat out where it was hard to follow the diet. Here’s a sample from the week after I hit 185. I shifted the days of the week in my worksheet so that Saturday, my usual cheat day, was at the end of the week. The point is not to be perfect every week. In fact there were two different weeks where I was out of town all week and didn’t make much of an effort to follow the diet. But it was pretty clear that when I was acting on the lead measures I would lose weight. When I actually gained weight a couple of times the lead measures sheet and the scoreboard helped get me back on track. I have not been using the Lead Measure sheets for a couple of weeks. I’ve relaxed a bit about the diet, but I’m finding it still enough of a habit that I weighed in today at 183. I’m sure I’ll have to break out those sheets again sometime, maybe if I break 190, or if I decide to lose even more. I’m going to try and balance the diet a bit but I want to hold my weight at or under 185.